Making a fun day in the park into . . .
After creating short videos for a few years now, enjoying the process of arranging music against photographs and videos with no other goal other than to fill my blog, I was able to use those skills recently for a practical purpose: to create a video of J. R. Blackwell’s kickstarter for Shelter in Place, a role-playing game. Luckily, iMovie, provides a series of project templates, including movie trailers. One of these trailers fit perfectly with the theme of Zombies, with proper music and title display. What I didn’t realize before about these templates is that they can be imported into a project so the producer is not confined to the established time formats. On one of the hottest days in August, we drove down to Clark Park in Philadelphia where “J.R.” and her friends were set to create film footage on the Zombie experience. 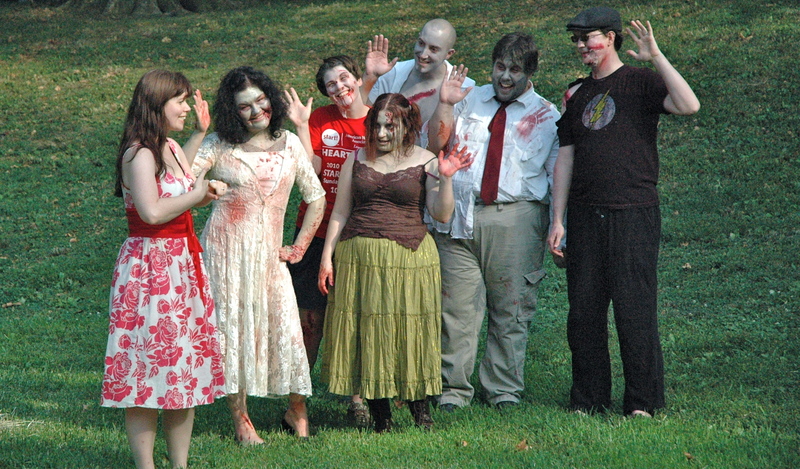 Dressed in costumes and in full makeup, the Zombie characters chased the “victim” up and down the field. Photographers lined up at different locations. Given that the park was fully occupied with vendors and picnickers, taking the pictures without those folks was tricky. Hip-hop music played in the background of all the footage. The video came together using a variety of sources. J.R.’s photographer friends took at least a hundred pictures, so the large selection provided a variety of choices. Several days before we stopped off at a country grave yard and filmed the cemetery at various angles. In June I attempted to take video of the rising moon, which turned out wobbly and thought the video would be totally unusable footage. However, a few seconds of the moon rolling around in the sky had a spooky effect in this movie, so I added a few of those frames. I blued all the films, and photos, changing a bright summer day into night. J. R. and I edited the content of the titles. We added a commercial at the end. Altogether, we edited the video at least 25 times before being satisfied with the final production. The happy ending: Shelter in Place reached it’s kickstarter goal in just two days!